I’ve now been in Israel almost 6 weeks taking a Greek course (see last post.) I wanted to share a few more pictures from my class here. I’m flying home next Monday. People occasionally ask me, why would a person study Greek in Israel? One reason is that you can go to the sites of New Testament events and read the original text right as you stand on the spot where it happened. You can see the things that the text is describing right in front of you. 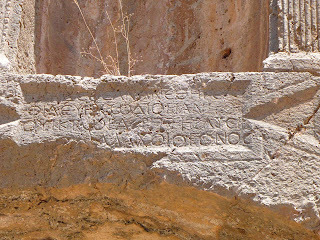 And also, the ancient sites are full of Greek inscriptions. Everywhere we go we have fun reading the texts that have been there since the time of Jesus. Last week we had a three day field trip to northern Israel. We stayed at a hotel on the Sea of Galilee and swam there each night after long days of touring sites in the north. 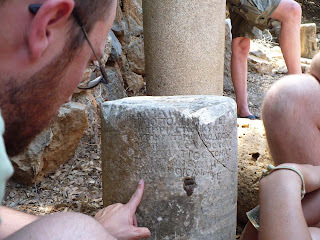 Many archaeological sites are full of Greek inscriptions, so we stopped and tried to read each one. Here are some pictures from Cesarea Phillipi, near Dan. 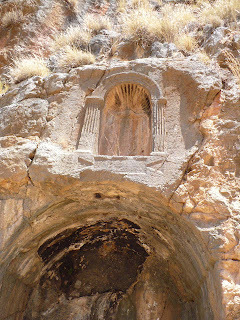 There used to be a large temple for the god Pan there, and around at the cave entrance that was the source of the Jordan river, there are many niches (carved shelves in the rock for shrines). I’ve been there before and seen the niches, but this time we noticed that each one had a Greek inscription below it. We couldn’t read all of the text but we could make out the words “To theo Pan” (to the god Pan). It is on the second line, just to the right of the middle. So we ourselves can read that these were dedicated to the god Pan. That was kind of cool. 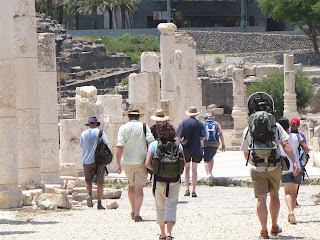 We walked through the ruins of cities like Beth Shean and Caesarea Maritima and read the ancient mosaic floors. It’s neat to learn the language from the land itself. I’m now two weeks into my Greek course in Israel, and finally get a chance to write. I’m staying at a lovely retreat center outside of Jerusalem at Kibbutz Tzuba (see this link). 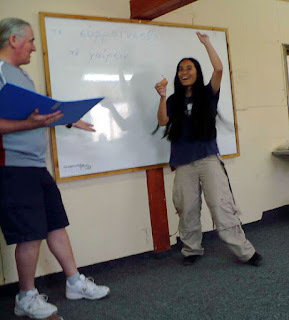 There are about 15 students in my Greek course, and 18-20 students in the beginning Hebrew and Intermediate Hebrew courses, which I’ve taken before. I’m the only student in my class who has never studied Greek before, but I’m doing alright. The course is fun but difficult – it soars right along, and students are supposed to pick up lots of new vocabulary each day. What is wonderful is that within only a few days of the beginning of the class, we were reading New Testament texts. We’ve acted out the parables of Jesus, including the story of the woman who has loses one of her ten coins, and the one about the man who holds a banquet and everyone has an excuse not to come. (The picture at left is of the joyful woman finding her coin.) It is amazing to understand the story in the original language so quickly. We are memorizing the Lord’s Prayer in Greek this week. Next week we’ll be going to Caesarea to read Greek inscriptions there. You can read all about this unique course at the http://www.biblicalulpan.org/ website. I want to say thank you to all you friends who stop by this site and read my latest ideas. I apologize for not being more regular at writing. I’m sure many of you are wondering what I’ve been doing since I finished working for En-Gedi at the end of 2006 (due to financial changes in the ministry).The thing I’ve felt most called to do is to write. Just as we were making the decisions regarding En-Gedi last year, I had an opportunity to move much more in this direction. A woman who is an author and has worked in publishing for many years contacted me about submitting some book proposals to Christian publishers. That has been my project this past spring. In other news, in just a week, I’m going to Israel again (for the sixth time). I’ll be there for a six-week Greek course taught by the Biblical Language Center. I’ve done this twice before to study Hebrew, in an intro class and then later an intermediate class. The creator of these classes is Randall Buth, an outstanding scholar of biblical languages who has also done a lot of thinking about Jesus’ words in his Hebraic Jewish culture. He and David Bivin, another knowledgeable author in this field, will be teaching the class. (See Jerusalem Perspective to read some of their work.) So along with Greek, I’m sure we’ll be discussing the implications of the Greek text of the Gospels and what Jesus might have been saying in Hebrew. In the fall, I’ll also be helping to teach introductory Hebrew at Western Theological Seminary, in my home town of Holland, MI. This seminary (of the Reformed church) has adopted the innovative approach developed by Randall Buth for teaching Biblical Hebrew – teaching it as a living, spoken language, rather than dissecting a text with grammar rules. The human mind learns much more quickly this way, with much greater comprehension, than by the teaching methods of a hundred years ago. They are the first seminary to decide to overhaul their teaching approach, and since I’ve studied with Buth, it makes sense for me to help. You can see that the Lord has had his hand on my life through all these changes, with some huge new challenges in writing and teaching. I really covet your prayers for protection and strength for the coming days. And please keep in touch! My email is l t v e r b e r g @ g m a i l . c o m (without the spaces) if you want to drop me a line. 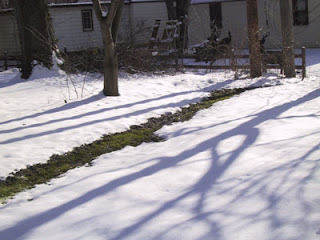 Why is this blog about a wellspring? Throughout the Bible, God calls himself the source of “Living Water” and Jesus said that whoever believes in him will have living water that flows up from within. When I study the Bible, it feels as if I’m drawing from that wellspring of living water for myself and others. If I don’t do it, I become dry and parched, but if I do, I have plenty to share with everyone. If you want to refresh yourself, you are invited to drink of my latest thoughts here, at the wellspring of my thinking. I’ve been fascinated with the idea that some how teaching about the Scriptures relates to the idea of water flowing. Of course, Living Water is often related to the Holy Spirit, and God speaks of himself as the “spring of living water.” (Jer. 2:13) Why? Because he is the source of life, and in that desert land, water is extremely necessary for life. Many rabbis have pointed out the connection between God’s word and Living Water and added their wise thoughts (read more here). on February 20, 2007 at 10:50 pm Comments Off on Welcome to the Wellspring!